Japanese love fish. We eat much more fish than people in other countries. Therefore, we eat fish in various recipes. 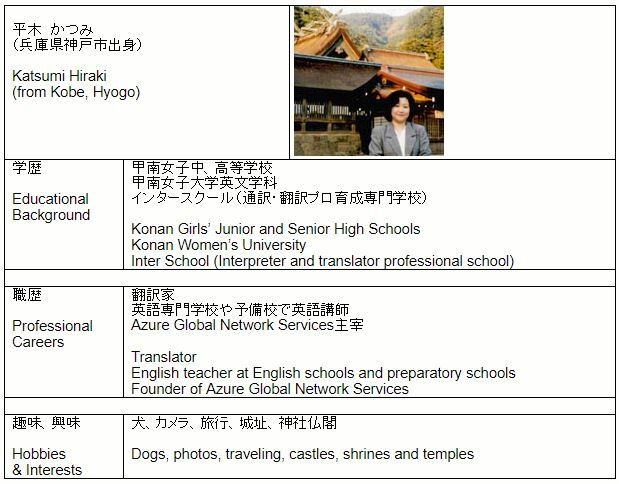 Even grilled fish (or broiled fish) has many variations such as shio-yaki (grilled fish with salt), teri-yaki (grilled fish marinated or glazed with teriyaki sauce), miso-zuke (grilled fish marinated with miso) and himono (dried fish). We love sushi, sashimi and fish tempura, and in winter we enjoy fish nabe-mono (hot pot dishes). 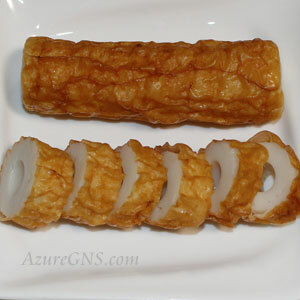 Fish sausage is a ready-to-eat snack for children and for adults it also goes well with alcohol. 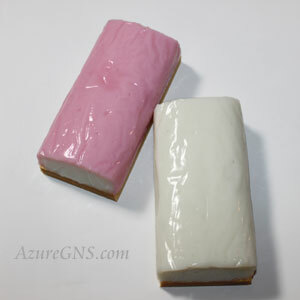 In this blog, however, the focus is on kamaboko. 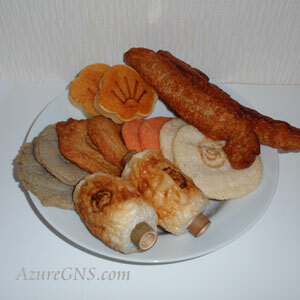 Basically, kamaboko includes almost all cooked neri-mono (fish paste or ground fish). For example, there are fried ground fish, satsuma-age, and boiled, chikuwa (boiled or grilled ground fish in a bamboo-like shape) and hampen (fluffy boiled mixture of ground fish and yam). Kani-kamaboko, or kani-kama for short, is similar to the leg flesh of snow crab in appearance and texture. To be precise, however, kamaboko is steamed or baked ground fish on a small wooden board. This board soaks up excess water from the ground fish, and enables kamaboko to last longer. 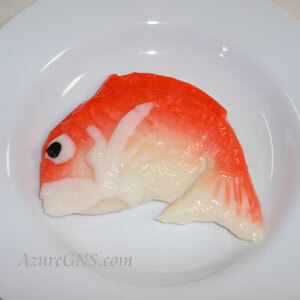 This kamaboko is made only from whitefish. First, fish is washed and the blood and fat are removed. Afterwards, it is ground up and mixed with egg white, sugar, sweet sake and salt. 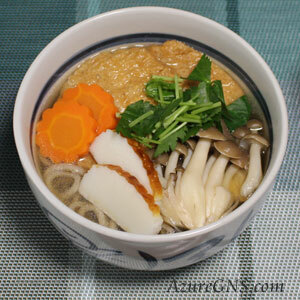 Then, this mixture is generally spread in semicircle on a small wooden board and is steamed or baked. 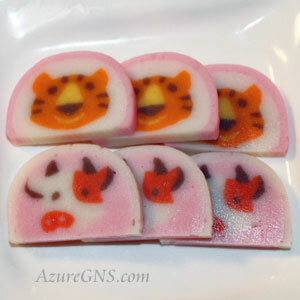 There are various kinds of kamaboko from region to region in Japan. 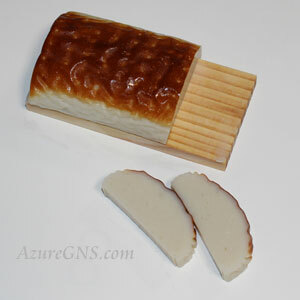 For example, a thin kamaboko, which is steamed and afterwards lightly baked, is popular in the Kansai area. Saiku-kamaboko in Toyama Prefecture in the shape of good-luck items such as a tai (a sea bream), Mt. Fuji, a takara-bune (a treasure ship), or a turtle are indispensable for celebrations. In Toyama Prefecture, maki-kamaboko, rolled kamaboko, is also very popular. Moreover, sasa-kamaboko originated in Sendai City, Miyagi Prefecture is shaped like a bamboo leaf, and doesn’t have a board. In the old days, kamaboko was not what it is now. Kamaboko meant Chikuwa. That’s because Chikuwa’s shape looked like the ear of gama (a bulrush or a cat tail), cattail. 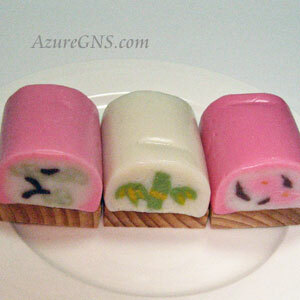 Kamaboko dates back to 1115 (Eikyu 3rd yr), according to the old record. Long afterwards, Japanese invented how to make the kamaboko of today, putting ground fish on a small wooden board and steaming or baking it. In those days, however, whitefish was expensive, so people couldn’t afford to eat kamaboko often. Therefore, people sent special kamaboko in the shape of red fish, tai (a sea bream), and a ship filled with treasure, for the congratulations of marriage. However, after whitefish became less expensive, everyone began to eat kamaboko in daily life. Today, people can buy kamaboko at a low price in the supermarket. 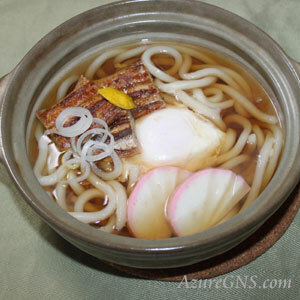 The most common situation in which we see kamaboko is a slice of kamaboko on soba (buckwheat noodles) or udon (wheat noodles) in a bowl of hot soup. After all, the grand stage for kamaboko is Osechi-ryori. During O-shogatsu, New Year Days, Japanese traditionally eat Osechi-ryori, special dishes arranged and served in ju-bako (a set of lacquer-ware boxes). Kamaboko doesn’t play the leading role, but there is no doubt that it is essential for Osechi-ryori. 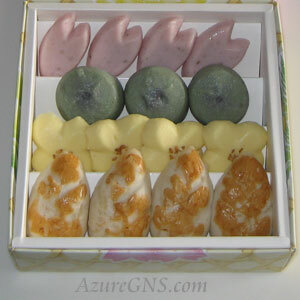 Various kamaboko make boxes more colorful including red-white kamaboko and kamaboko with patterns of lucky charms such as Sho-chiku-bai (pine, bamboo and plum trees) or Eto (the twelve signs of the Japanese zodiac) of the year. 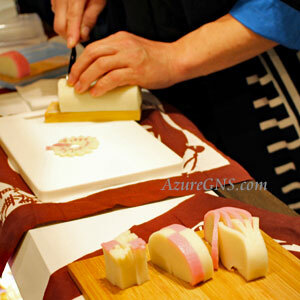 Kamaboko is easy to cut decoratively so it is also suitable for a party. Beautiful flowers and cute creatures are made by making cuts with a knife and tying or holding them. The sales of ground fish products including kamaboko have recently been dropping for various reasons: westernization Japanese eating habits, price increases of material such as tara (cod), guchi (silver croaker) and eso (lizardfish) and a long recession. Each company or shop of ground fish products is giving high priority to the development of new products. Fish dishes are one of the most traditional Japanese cuisines, but some foreign people don’t like fish. However, probably just looking at kamaboko they don’t think it is made from fish. Therefore, kamaboko is the best food to enable foreigners, who don’t like fish, to taste Japanese fish dishes.